Fix Jeeps hand tool reviews is where I can tell y'all what I think about different tools on the market. Also providing you access to purchase the tools if you like. Welding and cutting tools such as stick welders, MIG welder, plasma cutters and welding helmets. Also, various air cutting tools and accessories. Cant forget air tools! Impact wrenches, die grinders and various attachments. Ya never know what I'll decide to review. So, keep checking back. I have a pretty big variety of brands of ratchets, sockets, extensions, etc. I'b pretty hard on about all of them. I can't say I'm loyal to one brand because I'll use anything that will work reliably and doesn't break the bank or have to take out loans to purchase. Majority of my hand tools are Kobalt. The reason being is that there is a Lowes close in town. They swap broken tools no questions asked. Aren't crazy expensive and they really are a very good quality tool. What tools have I broken? Well, that would be a few 12 point sockets, a couple of Allen sockets and gutted one 3/8 ratchet (cheater bars will do that .. oops). I also have some Harbor Freight and Northern Tool wrenches that have taken some serious abuse. No cracks, no breaks ... still flawless. I have use many different brands, models and sized welders. From commercial sized MIGs and stick to hobby models. I have and old Hobart Handler 140 MIG and 2 Lincoln AC-225 "tombstone"stick welders. I've had the Hobart 140 for 15+ years, its been flawless and so easy to use. The AC-225's I bought from other people. I only use one of them because of the extra looonngg leads. So, Im not claiming to be a pro, but I've laid down my share of beads. Here is my "go to" welder if I wanna burn the beads in DEEP! 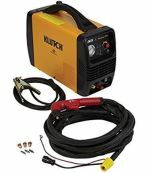 Its a Lincoln Electric AC-225 Stick welder. I love this reliable freakin hot old "tombstone" welder! Full review coming soon! This Hobart Handler 140 is a sweet little wire welder. It does flux core and gas mixes. It will even run aluminum wire. Burns into 1/4" plate all the way down to 24 gauge. It will run the small 2lb spools of wire or the big 10lb spool so you can lay many beads in between spool changes. I can't find the exact brand of helmet I have. But, its made by Jackson and this is the closest model with the same features I could find. The variable Auto Darkening Filter is awesome! I've used a few different brands and sizes of plasma cutters. Two of the models were nice sized hobbist sized machines. The other was a commercial BEAST of a Miller! I have to admit, once I put down the old torches and picked up plasma for cutting, I've been hooked every since! I haven't touched my old Oxy/Acetylene torch in many many years! I've cut metal as thin as 18ga to 1/2" plate. I've got a bit of experience with them. So, I feel like I can give an accurate and fair review. Many years ago I had a Hobart AirForce 400 plasma. That model is no longer available. The latest model of comparable size is the Hobart AirForce 27i. I could walk through 1/2" plate no problem. Full review coming soon. This is the Klutch Plasma 375i. I was pleasantly surprised at this little hobby sized plasma cutter! It has no issues at all slicing through 3/8 plate. Anything thinner is like running a hot knife through butter. Full review coming soon.